When I'm trying to come up with new baby food purees, I have several unspoken criteria that I always try and meet_ I want to make something that tastes smooth and creamy, but also provides as much visual interest and nutritional value as possible. There are certain foods, like broccoli, that meet almost all of my standards_ it's loaded with essential vitamins and minerals, has beautiful color and is delicious when steamed on its own. 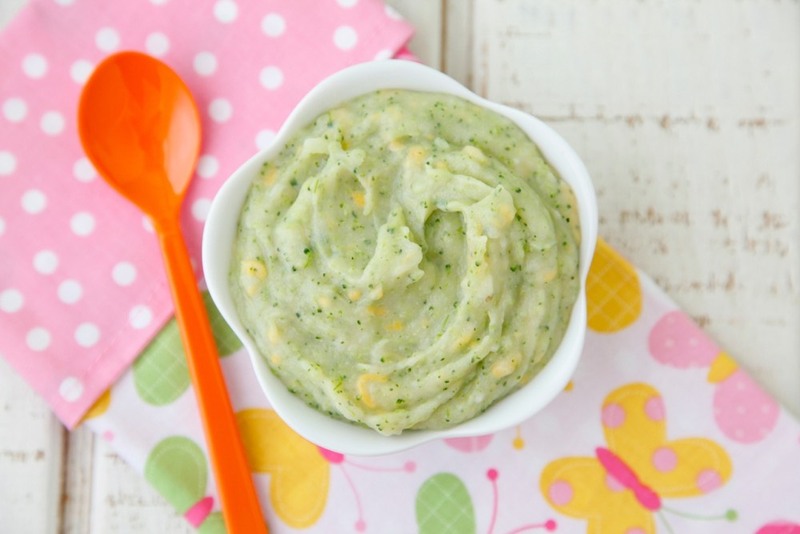 But pureed alone into baby food and the results are watery and bland. Still, broccoli is so nutritionally ideal for babies, I refuse to disqualify it just for being blender-averse. Instead, I simply combine it with a couple of other select ingredients and, voila, it's perfect. 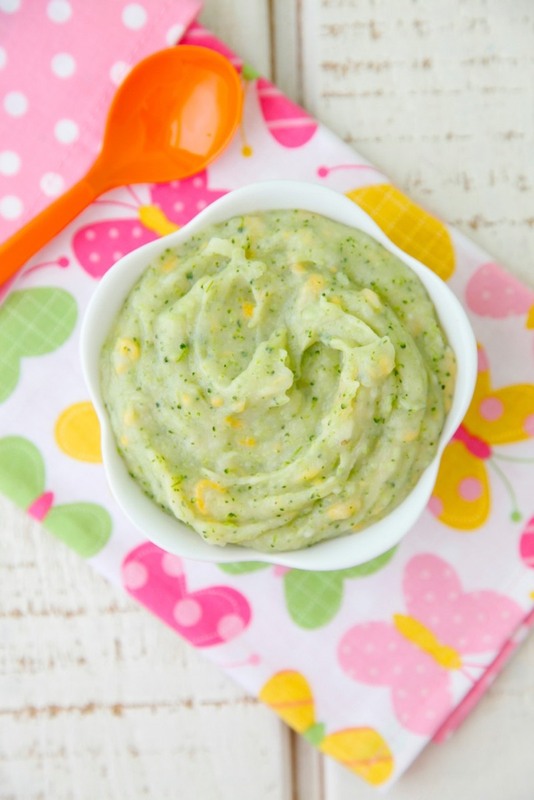 By adding potato and cheese to this recipe, the broccoli incorporates beautifully and the resulting Broccoli, Potato and Cheese Puree has a smooth texture that's perfect for babies. In addition, the cheese provides a healthy dose of dairy, making this dish a superstar. Both of my kids ate this regularly when they were starting solids and never seemed to get enough of it! 1. Place the potato cubes in a steamer pot over boiling water and cook for 6 minutes. 2. Add the broccoli and steam for an additional 4 minutes or until vegetables are fork tender. 3. Place all the ingredients in a food processor and puree. thanks so much for this lovely recipe my son loved it and i was finally happy that he was eating potatoes. he just would never eat them wit your recipe he loved it. thanks again! I just made this for my daughter. She ate it up as fast as she could! I was wondering how to store the rest? Store in an airtight container in the refrigerator for up to three days, or freezer for up to two months! which cheese brand do you use? I'm trying to find something organic for my baby. I do a lot of shopping at my farmers market (where there is a cheese vendor) and Trader Joe's. Trader Joe's and Whole Foods both have lots of great options! I have a 7.5 month old and I am wondering if giving her cheese is ok. I heard you should wait until 12 months to introduce dairy, or are they only referring to milk. That only refers to milk! As long as your baby has tried each of these ingredients separately with no problems then you should be good to go! Hi! Looking at your broccoli, potato, and cheese puree recipe. The last time I put potato in a food processor...I made glue! It was a mess. How do you prevent that from happening with this recipe? How many ounces do you consider a serving? Thank you! Hello :) You will need to add more water. Did you add bits of corn to this recipe (image)? Looks delicious... will try with my LO this weekend. No corn, that is the cheese!